While I love a beautiful blanket of snow on a Christmas morn as much as the next person, I did not sign up for the five foot drifts that graced our home this season. As we were cloistered indoors over our holiday vacation, husband and I decided to collaborate on a 'weekend project'... which went a *little* overboard. Since the recent release of the Disney Pixar movie "Up" to DVD, I have seen the move *at least* 50 times. No joke. This is due to the fact that our little toddler has developed a massive addiction to the movie, and blistering-cold weather has prevented our outdoor time. Thus, naturally, Mom & Dad chose to take her newfound love and make the most of it. We decided to build her a cardboard "Up Playhouse." Now, husband will tell you, "I just wanted to stick a couple of boxes together, cut a couple of holes in them for windows, and call it her Up house. *YOU* took it to Crazytown." Together we put approximately 90 man-hours into her house. Husband was the engineering mind, investing duct tape, wrapping paper rolls & reinforced corner panels to the structure. I was on design duty; planning the architectural features and finishing the exterior by adding paper siding and shingles to the house. The entire project is composed of used cardboard boxes, cleverly recycled into the walls and rooflines of her new digs. All support pieces are from empty wrapping paper rolls & packing materials that came with said boxes. Mr. Sketch scented markers made a comeback this week, as I drew endless accent lines onto the strips of paper to be glued to the cardboard as siding (with my trusty bottle of Elmer's glue). I'm not going to lie... we went a little crafty-crazy with it. The interior isn't finished, but is already coming along with it's own cardboard fireplace and "Ellie painting" of Paradise Falls. And, of course, the house wouldn't be complete without a mailbox. Our piccola's handprint will be added to the mailbox in the future, but apparently paint on the hand was a traumatizing experience for the little princess, and we had to abandon ship after her hysterical screaming... Nonetheless, despite the handprint hiccup, I think the project was well worth the smile on her face as she took our hands and pulled us to the front door, wanting to share her new house with Mom & Dad. You didn't just take it to crazytown...you are the mayor of crazytown!!! Looks pretty awesome. So very impressed. bonus points for the repurposing...for days. seriously. SERIOUSLY. Send that to Ohdeeoh! saw this on Ohdeeoh. Fabulous job! I love this! I posted about it on my blog, were I commented that my husband & I would have the *exact* same conversation (we have, just not about cardboard boxes), including use of the word "crazytown". 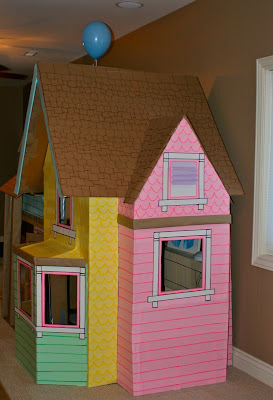 Way to go - gorgeous playhouse! I can't believe it. That is so amazing, and now I want to find me some nice cardboard boxes. wowowow! amazing job! 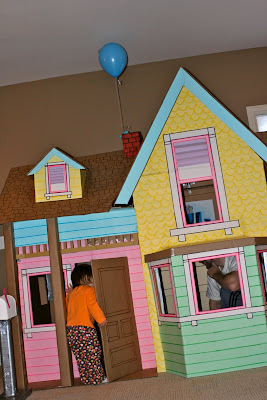 saw this on oh dee doh and thought it was a dollhouse...but it's her size!? WOW! super cool. AMAZING! I would love to learn how you did it! do you have a tutorial? oh please can I come play!? This is the most amazing play-fun-wonder-house EVER!!!!!! Sadly there is no tutorial. We just used our imaginations, cardboard, duct tape, good music and wine... and made it up as we went! ... who has created a very detailed scale model of the house. This saved us from 'freeze-framing' the movie to obtain details of the architecture. How wonderfully inspired. SO amazing! WOW, WOW, WOW! I can't believe you made that! You are both awesome and she is one lucky little girl! Please can you post the detail?? How many cardbox which sizes and how old is your daughter. i want to make this for my kid as well. i would appreciate if you write a post in detail. i loved it.. Good job!! We made the cardboard house nearly 7 years ago when she was a toddler, so I am not certain of the sizes and quantity of cardboard we used. However, we used miscellaneous sizes of scrap cardboard and duct taped together smaller pieces to make larger wall pieces in some areas. Once it was covered with the colored paper, you can't tell that the walls are a patchwork of cardboard pieces. We doubled up the cardboard in the corners to reinforce the corners and make the structure sturdier. Unfortunately we didn't really write down measurements or create a template; we just eyeballed the general proportions and worked with our ceiling height and the cardboard we had available.